I was not sure about trail except the range, totally confused to finalize the route, googled and seek the expert suggestions, 75% village lonely trail, enormous waterfalls, camping at Govt School in remote village of Yana forest range, visit to popular Yana, ending the ride at beautiful Gokarna beach, self-made yummy food, lovely friends company!!! 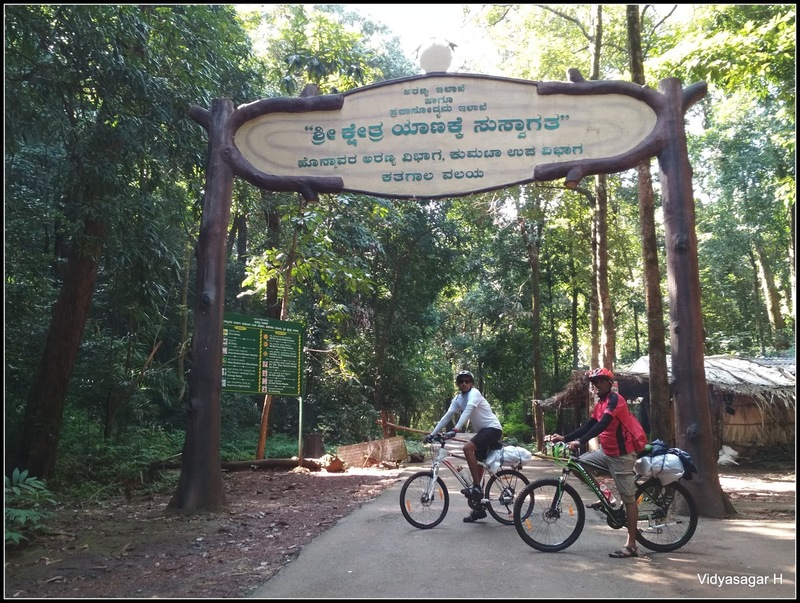 It is one more memorable bicycle tour from Sirsi to Gokarna on 23 – 24th September 2017. Unplanned camping added more thrill to our journey. This is my second ride in this month, the first one is Sharavathi Valley. I am thankful to Md. Rafi & Rajkumar Khot for guiding to finalize the route. 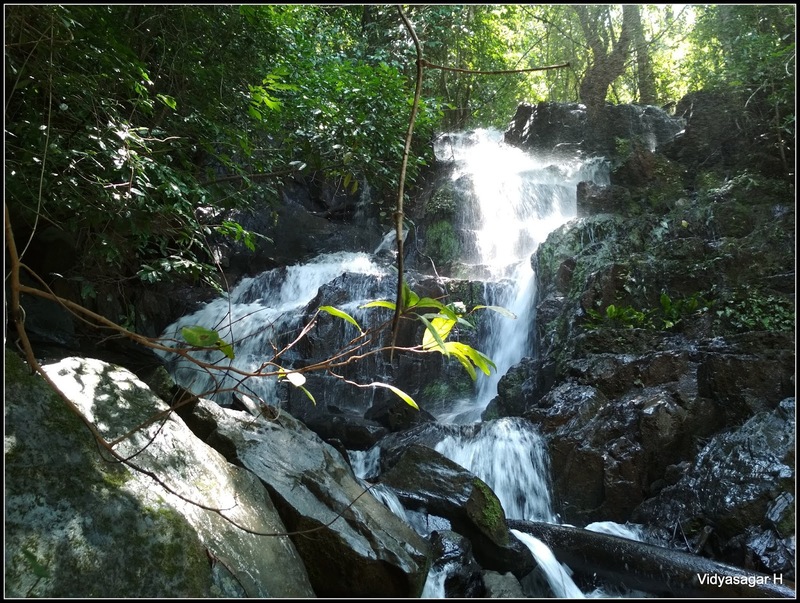 Initially, we thought to start from Yellapur, explore the surrounding waterfalls and end at Gokarna. There is no Volvo Bus service from Bengaluru to Yellapur. 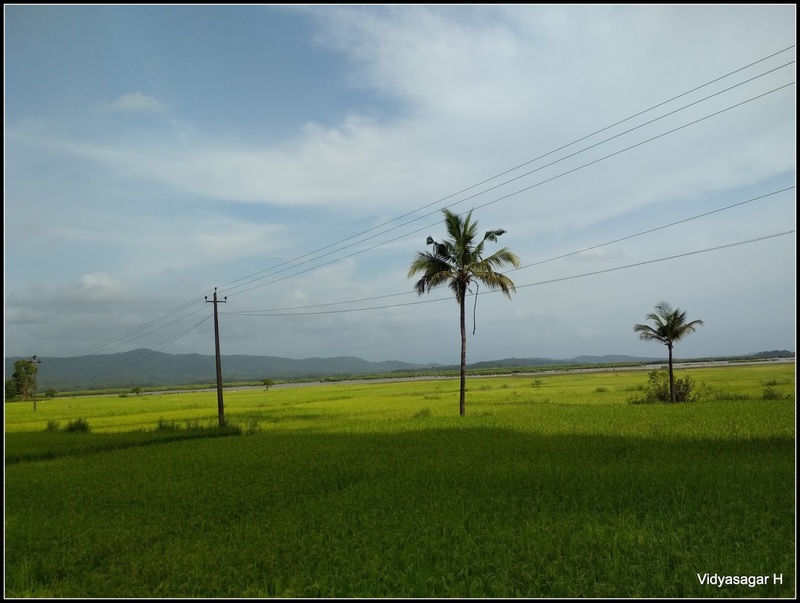 Considering the non-availability of bus and boring highway ride, changed it Sirsi – Yana - Gokarna. 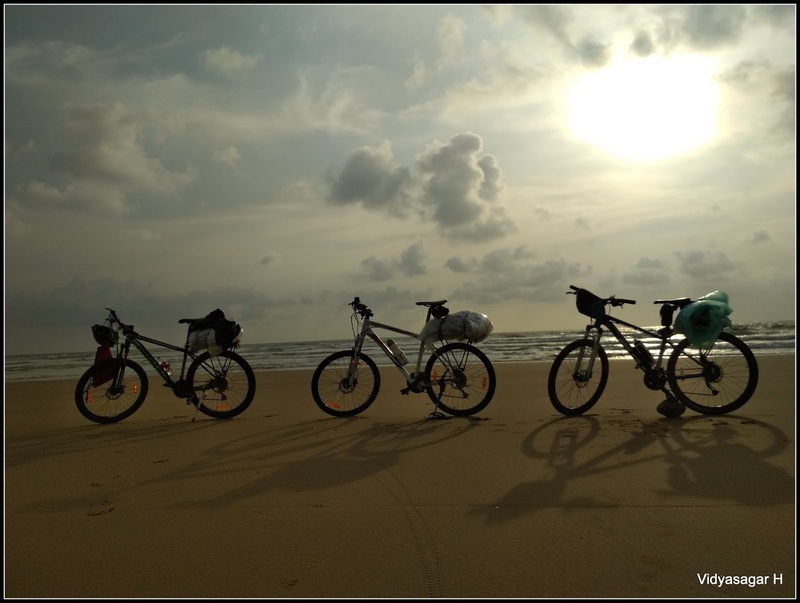 Team size stick to max 4 members, however only three of Santosh Kumar, Sudhakar & myself ventured the ride. Accordingly booked the ticket from Bengaluru to Sirisi and back from Gokarna to Bengaluru. The day was busy and complete tight schedule for me. Since, I have to attend a Summit at external venue somewhere near Mattikere, worried more about time. My day is started at 5 am with preparation of Chapati’s. This time, I decided to take self-made food. Evening I was back at 7pm and engaged in preparation of Tomato curry, however Chapati's were prepared in the morning. After finishing the task, rushed towards Majestic to catch the bus. The bus departure is around 10.15 pm. Sudhakar & Santosh reached well in advance to the bus stand, bus also arrived on time. Loaded our bikes and relaxed in our seats, journey went well. 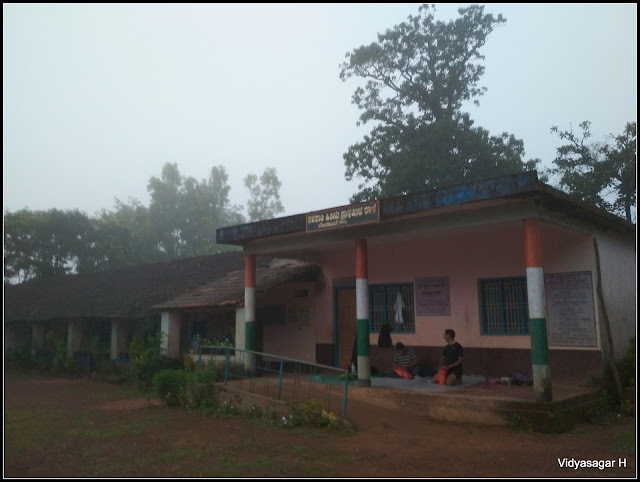 We got down at Sirsi around 7.30 am, bus got delayed for two hours. Refreshed in the public place and inquired the people about good hotel. 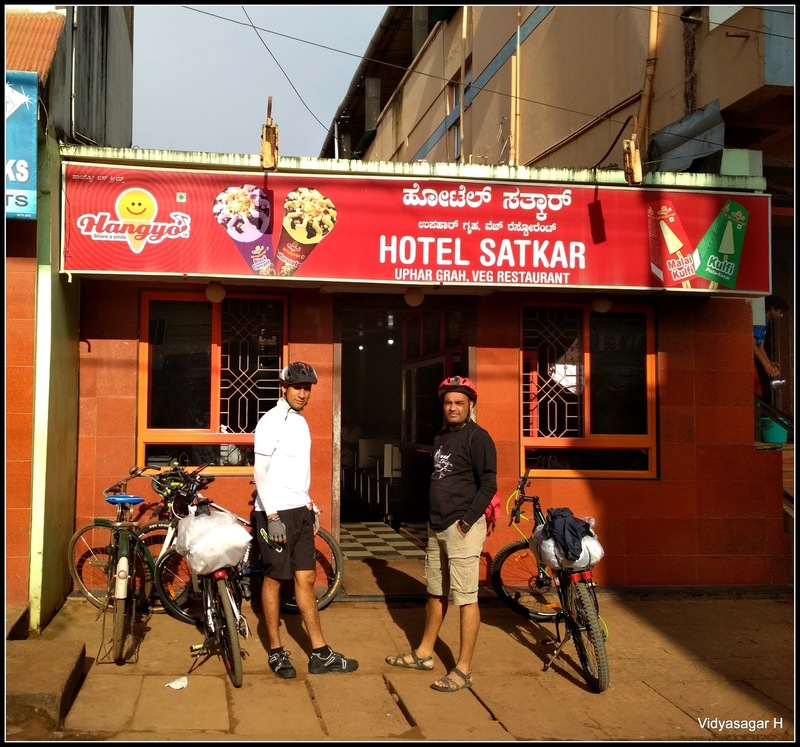 Localities recommended “Hotel Satkar”, filled our tummy with yummy breakfast. 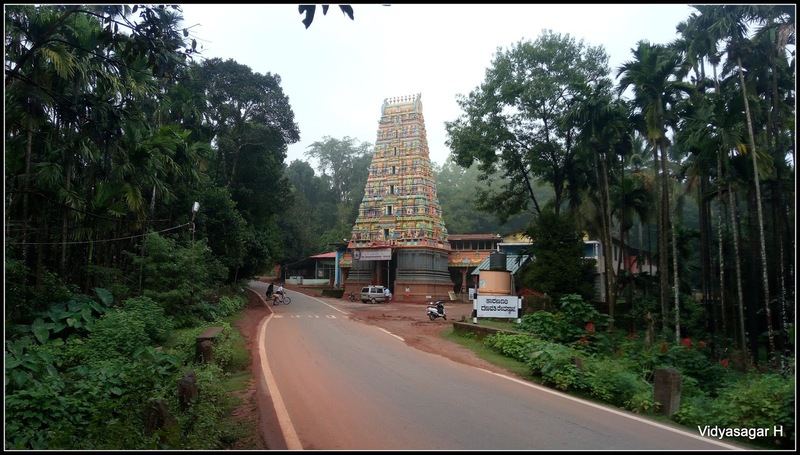 Journey started from Satkar hotel towards Sirsi famous temple 'Maarikamba'. The temple is in centre of town. There was a special pooja going, on event of Navaratri. 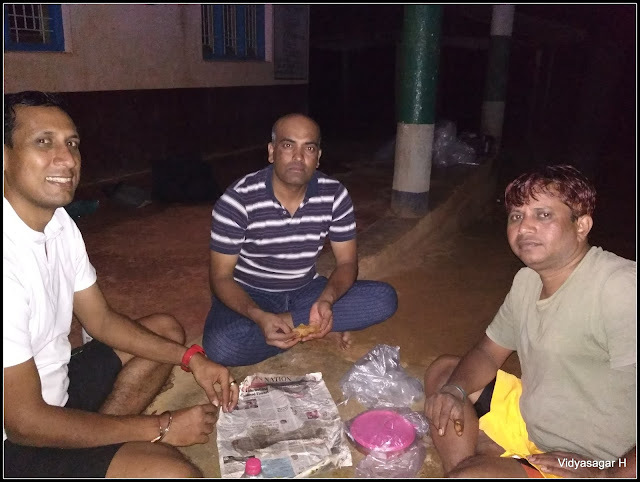 Considering the time factor, paid our darshana from outside and continued journey towards Unchalli falls. 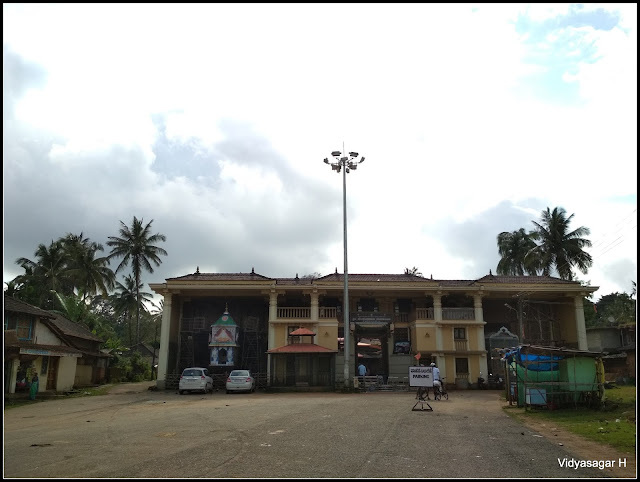 Very soon we crossed the Sirsi town, hit on the Kumta – Sirsi highway. The weather was cool, we come to know that, heavy rain stopped just a day back. Rolling trail we reached a village Amminalli. We have to take a left deviation from highway towards Unchalli falls. The village road gives you more joy than the highway. The weather slowly started turn to hot, sun started to itch badly. However, the beautiful trail will wipe your tiered, reached the village Heggarne. We decided to take a small break, purchased fruits, cucumber and snacks. The Unchalli falls is another 6 KMs from this village, continued our journey. 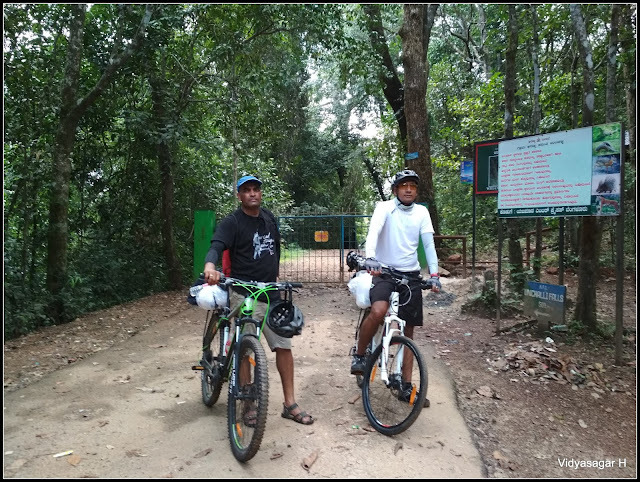 Reached the forest check-post, paid Rs.5/- each as entry fees. The trail is little tough from this point, rolling trail took us entrance gate of the falls. We were so happy, there were NIL of tourist. Another 600 mtrs mud down road leads to view point of the falls. We were just speechless!!!! We just heard the roaring of falls!!! The falls is really amazing!!!! 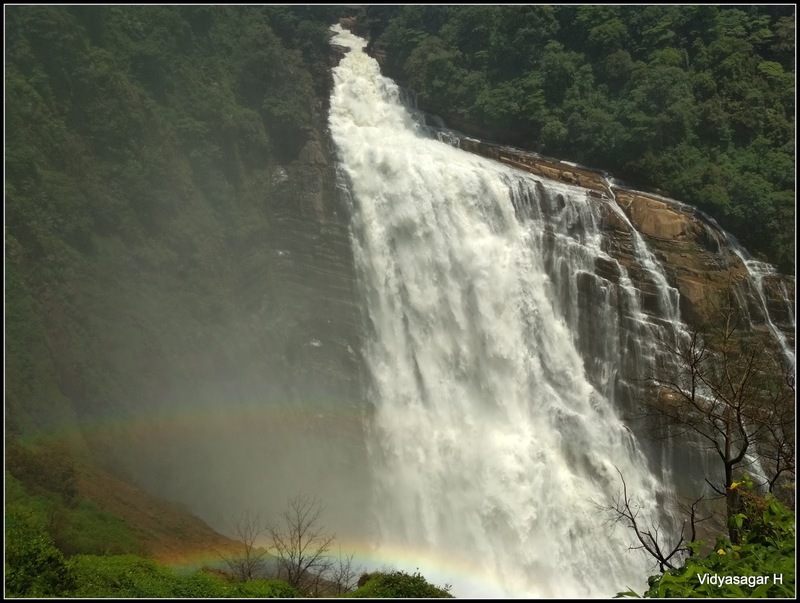 The falls is its monsoon glory time. Thanks to authorities who made very descent steps which leads to the beautiful view point. Hope this is my first falls view, where just standing in front of it and enjoying the view. The one Dudhsagar is similar view, however Unchalli falls is bigger. Spent good amount of time with photography and started back journey. We struggled little to push back till entrance. There is a pity shop near gate, you can find snacks, cool drinks and other eatable items. We had Badam cold milk and started back to the same village Heggarne. Sun itching was more, it made us more tiered, decided to take one more break. We found a descent small hotel where we had Lemon Soda. After the break journey is continued towards Yana. Absolutely the roads were completely empty, except local two wheeler movement that to be very rare. We set our-self target to reach Yana for day one camping. 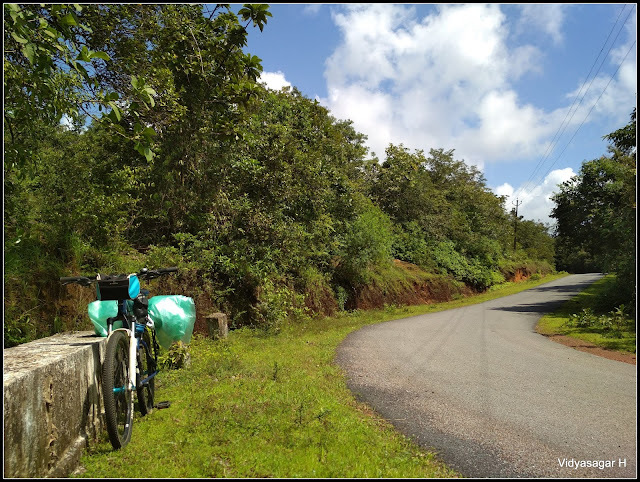 Taking multiple breaks, we again hit back to Sirsi – Kumta highway. On the highway, journey is continued around 2 – 3 KMs. Later took left deviation towards Manjuguni. 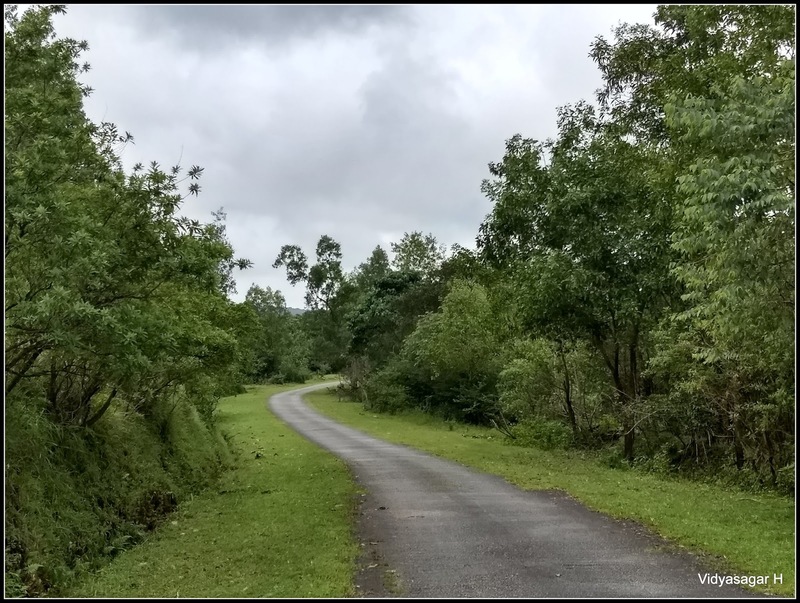 The Manjuguni is around 6 KMs distance from the highway road. There is a very famous Sri Venkataramana temple. Rolling journey, tiered body reached temple at 3.30 pm. Temple offer Prasad between 1 – 2.30 pm. We thought to reach in time of Prasad, however we have to satisfy by feeding Misal Paav to our hungry stomach. We skipped today's lunch, preserved the homemade food for today dinner and tomorrow breakfast. We had hardly 2 hours for sunset, the journey of Yana is around 30 KMs. Now we started to think about our first day camping. Just inquired at Manjuguni about the availability at Yana. 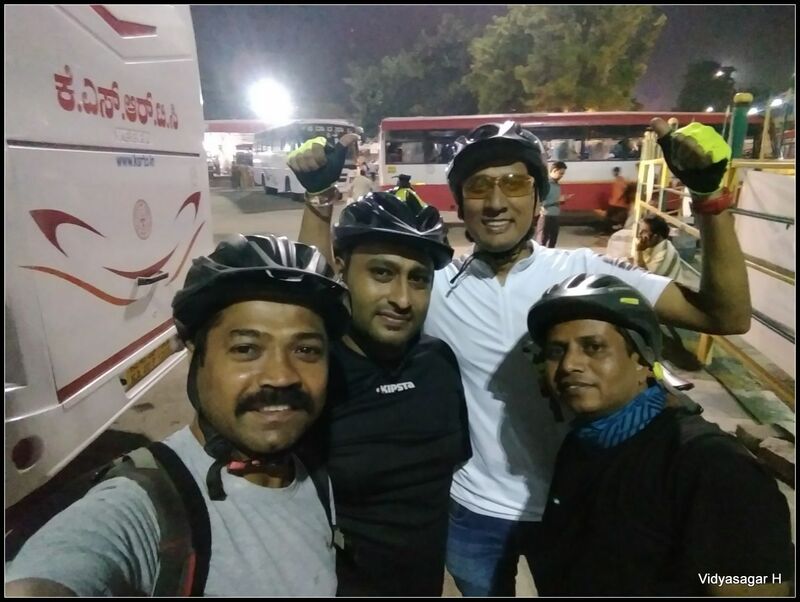 One of elder suggested to stop the ride at Devanahalli considering the thick forest ride in the night. Also, he mentioned about no any villages after Devanahalli and referred about the lodging facility. 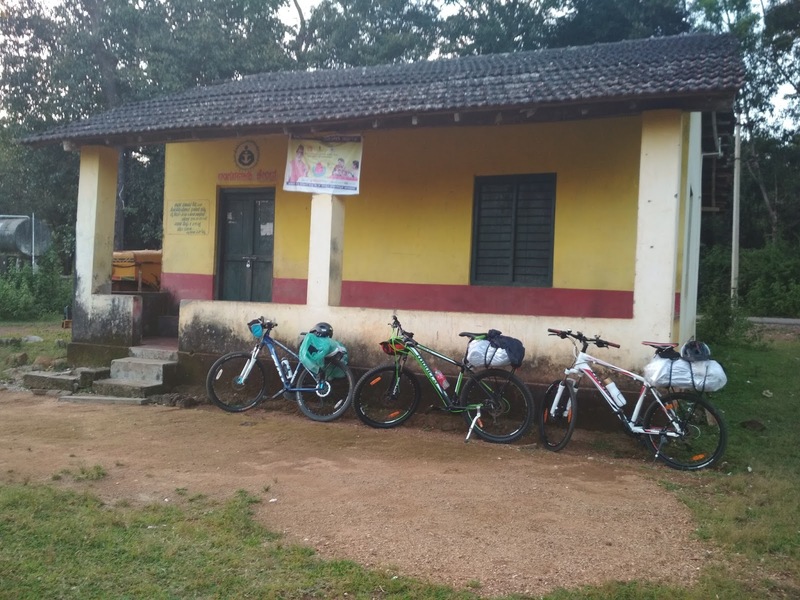 We had a discussion among us, decided to stop the ride around 6pm at nearest village and camp either School or Temple. All are agreed and continued our journey. Very soon we crossed the Devanahalli. We thought we have enough time. Indeed, after this village, we did not find any village. 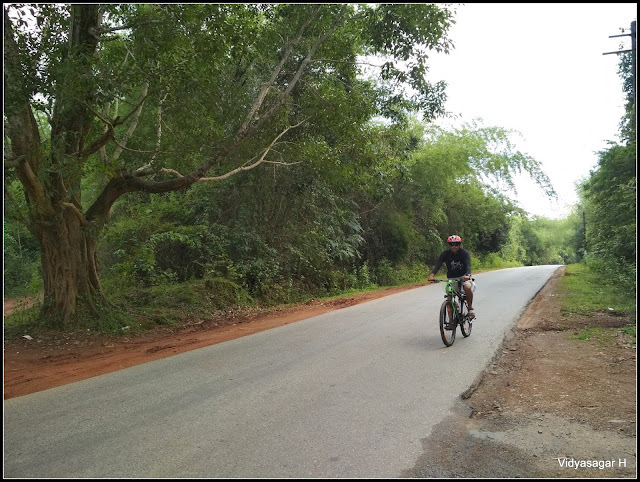 I stopped one of the two-wheeler person and reconfirmed about the trail. He also suggested to take a break at Devanahalli. 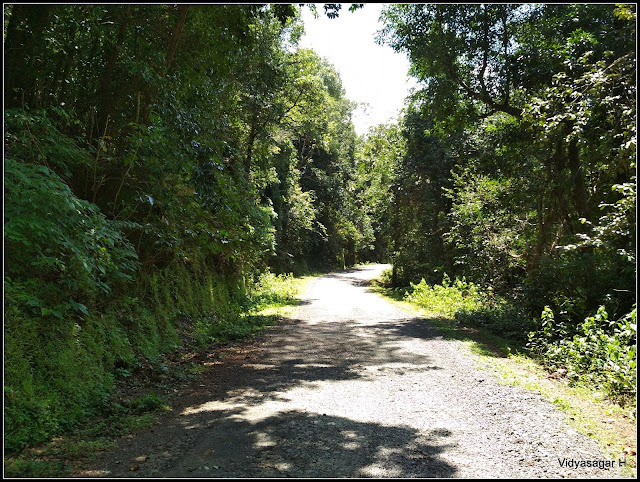 We ignored the suggestion and continued our journey in thick forest. The time was almost 6 pm, the sun setting down. The atmosphere slowly turning into dark. We reached a deviation where the Board showing Yana – 12 KMs and Benagaon – 4 KMs opposite direction. Even we were not sure about allowing camping at Yana. Waited for a while to get suggestion / guidance from the localite. The time is passed almost 10 minutes, heard a vehicle sound. I shown hand to stop the bike. A lady biker stopped with panic. Briefed about our camping concern, she recommended to go Benagaon. Appreciate her courage of solo ride in the evening in this thick forest. We decided to take one more suggestion before taking any decision. This time got localite in Mahindra jeep, again explained about our camping concern. 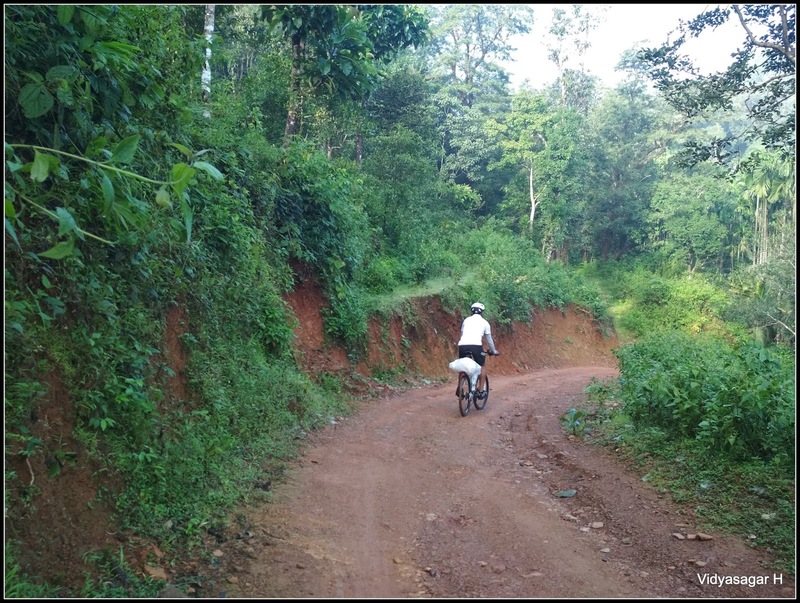 He suggested to ride Benagaon and camp in the village, again you can continue inner forest route to Yana. Now we were relaxed, just continued our journey towards village. 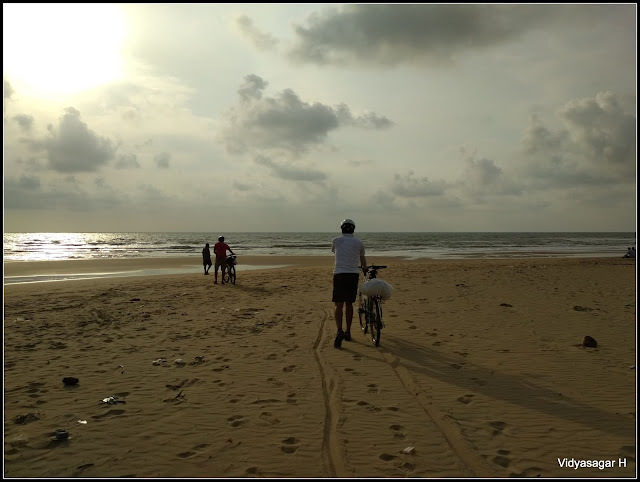 The sun is almost setting down, we come across one more two-wheeler guy. Voluntarily stopped to guide us to Yana, thought we took wrong route. I am explained about our journey, seek his assistance to set camping in their village. The good soul name is “Nagendra”, happily invited us to their village and promised to make comfort stay in Govt school. Reached a small beautiful village Benagaon. 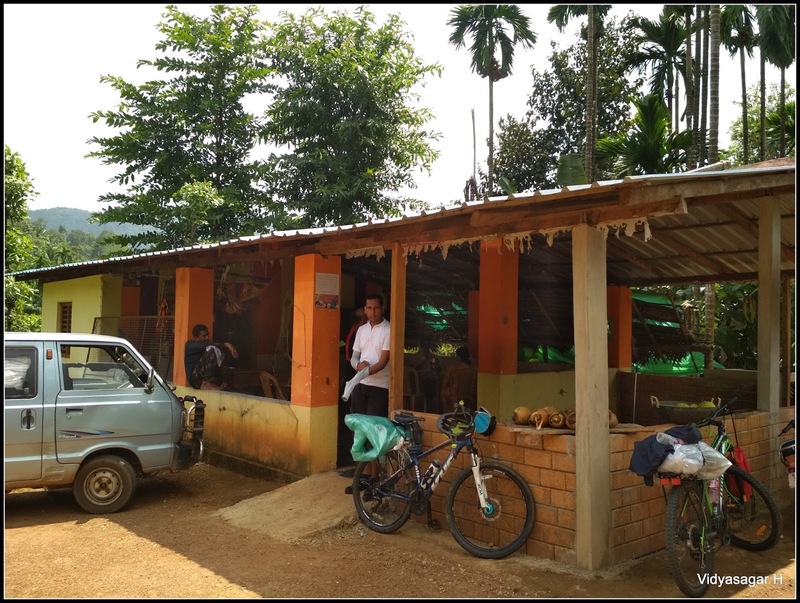 Hardly there could be 15 – 20 houses, well-furnished Govt Primary School and small pity shop. Children were playing Kabaddi, we met Nagendra. He just informed the villagers about our ride and stay tonight in school premises. Tiered body wanted refreshment, there was a borewell, decided to take a bath. We asked a bucket + mug at pity shop, happily they offered us. Chilled water refreshed our body. Children surrounded by curiosity to see our bikes. 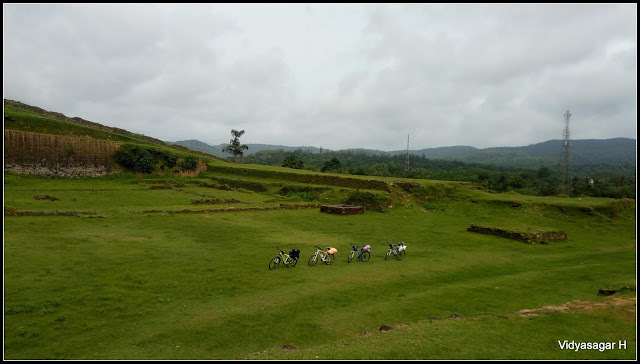 We offered bikes for a jolly ride in their village. After refreshment, we settled in the school. Thought to have a small walk around shop. Badly needed some hot tea to relax our body. We thought, the shop will sell the tea. Since it is very small village, understood they won’t sell tea. 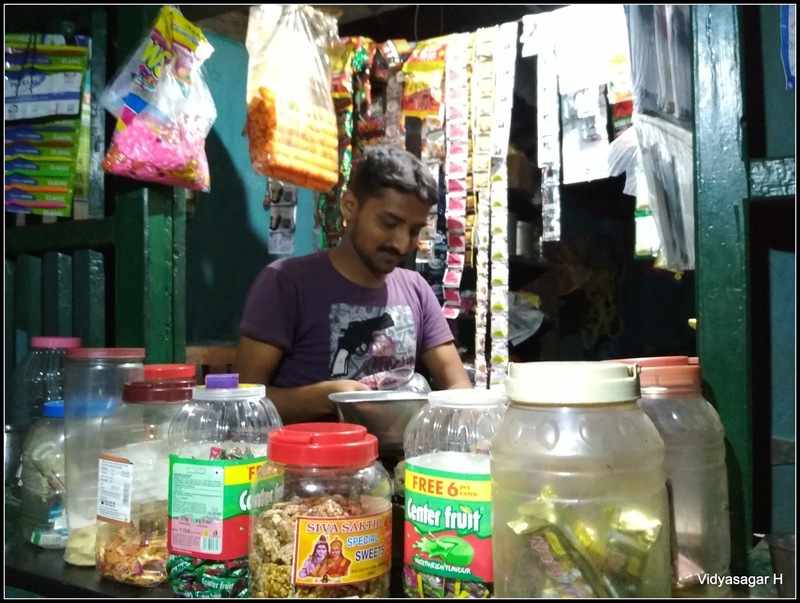 Just requested Raghavendra [Shop owner] to provide hot tea, agreed and served. We about to pay money he refused to accept it. Strictly warned us saying “not sell the tea for money, on humanity basis served for you”. We were just speechless, thanked him. Visitor of the pity shop asking about us. Hope almost half of the village come to know our ride. Now the dinner time, left to school. We skipped the lunch not to use the homemade food which will be required in the night. Set for ‘Torch Light Dinner’, finished the dinner. We come across many children, one boy is so curiosity about our journey. His name is Nagaraj, whose home is very close to the school. He arranged the drinking water. He was with us till 9.30 pm, shared his many adventurous incidents. Now the time to relax for the day. Day was memorable, we peddled around 84KMs. Morning got up around 6 am, we had good sleep. The place, school was really awesome, it has all facilities. Got refreshed at school, packed the luggage and continued our journey. Santosh also brought self-made Chapatis which we wanted to use for today breakfast. Benagaon to Yana connectivity forest trail is one of the best of our ride. 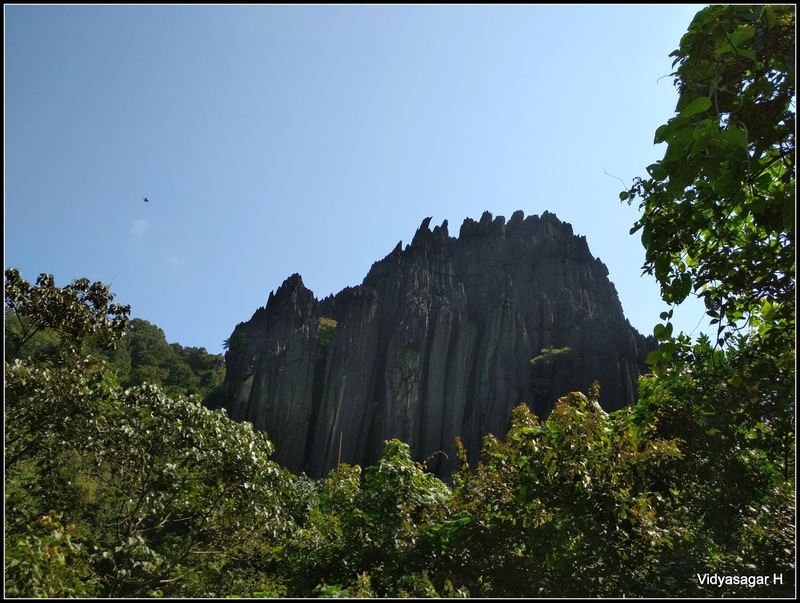 Almost 6 KMs trail, which pass through remote two villages, thick forest, countless waterfalls. 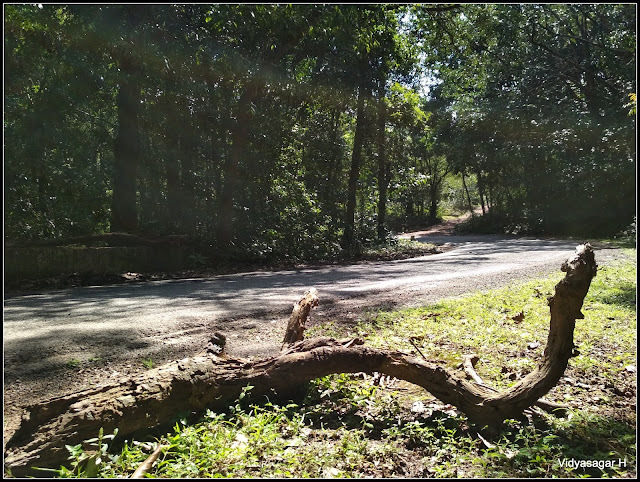 Beautiful off-road journey leads you Yana. 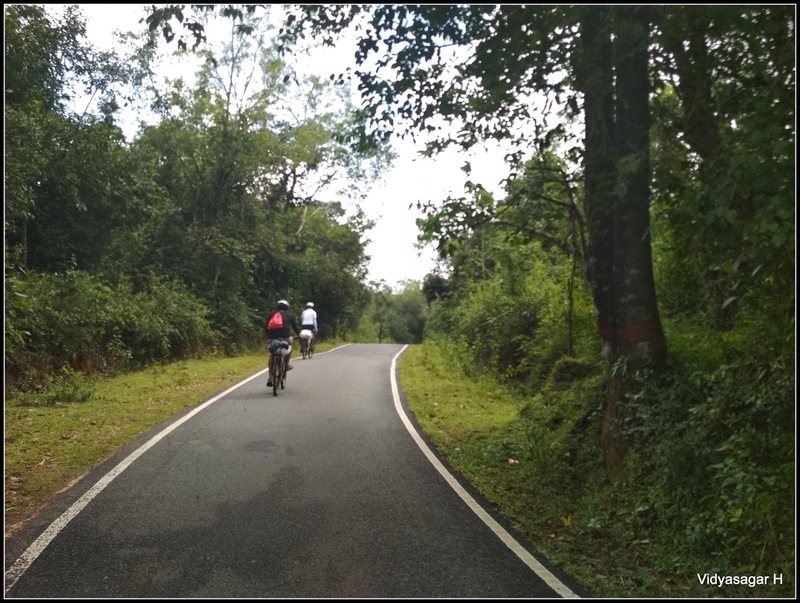 Spending good time on photography + shooting reached the tar road of Sirsi – Yana. Now the time to fill breakfast, we found small stream, decided to stop here. Thanks to Santosh for preparing yummy Chapatis, after spending little time continued our journey towards Yana. We reached the deviation point of Yana, the board showing 3KMs. 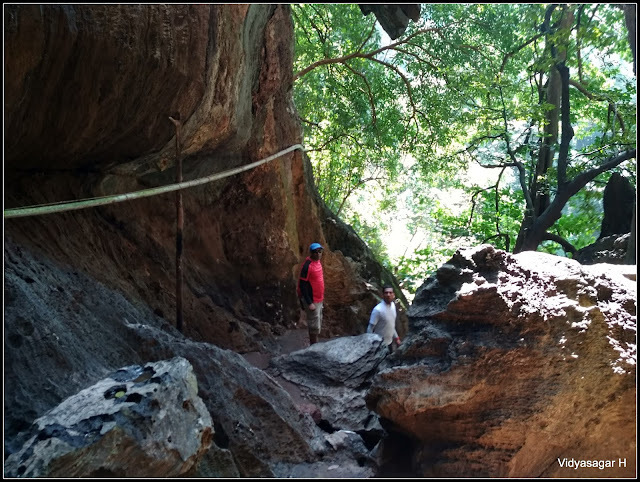 This trail is one of the toughest through our entire journey. The continuous 3KMS down trail take you the entrance of Yana. There is a small pity hotel, we can get cool drinks, tea and snacks. Parked our bikes near shop. We tried to gather the information about camping at Yana. Forest Department strictly made it as non-camping zone and also the wild life movement is more. The shop person confirmed that "even if you reach here night, forest officials send you back". We all appreciated ourselves to taking decision to camp Benagaon. 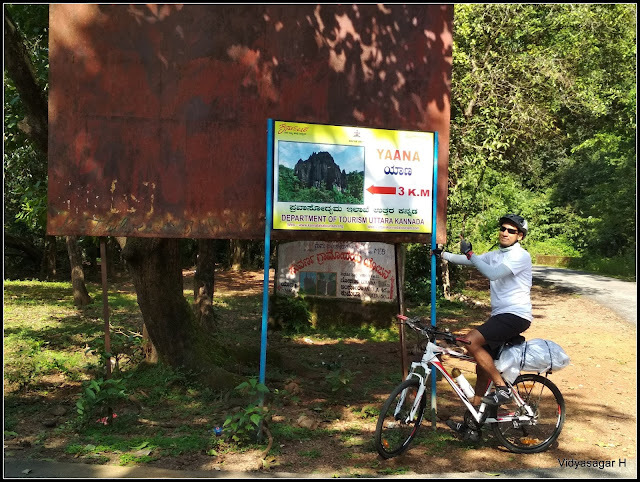 Continued our trek towards Yana. There are two ways to approach Yana. The one is from Kumta side [visited while back from SCUBA diving event] and another one is from Sirsi. We were lucky, there was crowd NIL you can say. 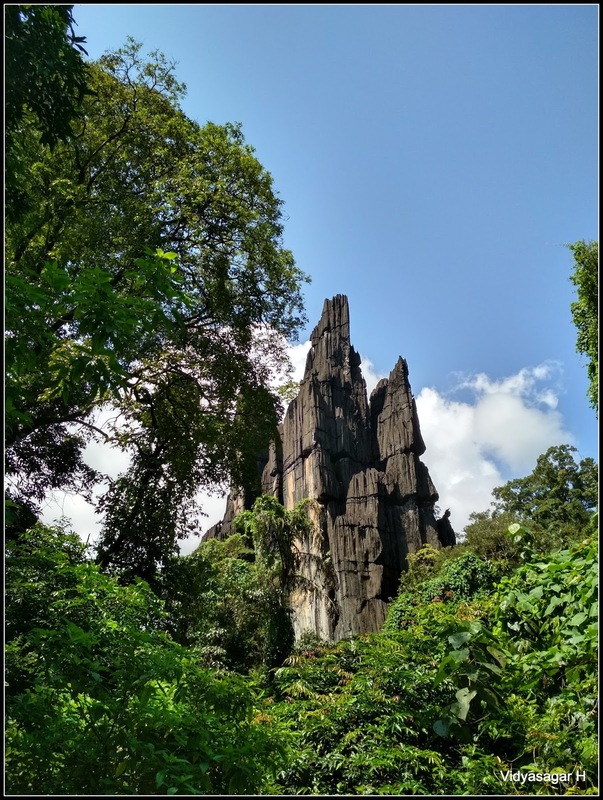 Paid darshana to Bhairaveshwara swamy, headed to explore the Yana caves. There was no limit of our photography, the caves are totally empty for us. 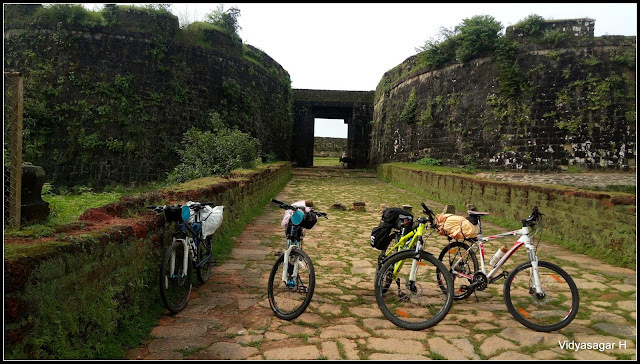 We spent good time exploration and back to entrance gate where our bikes were parked. Had Lemon Soda and some snacks, now the tough trail ascend of 3 KMs ahead of us. No one could able to ride on bike, we finished this trail while walking. The body got really tiered after this tough trail, relaxed for sometimes. 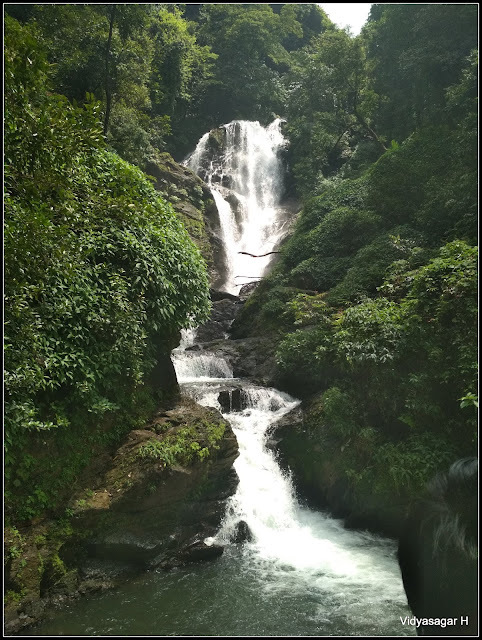 Now, the next destination is to Vibhooti falls. This distance was around 10 KMs. 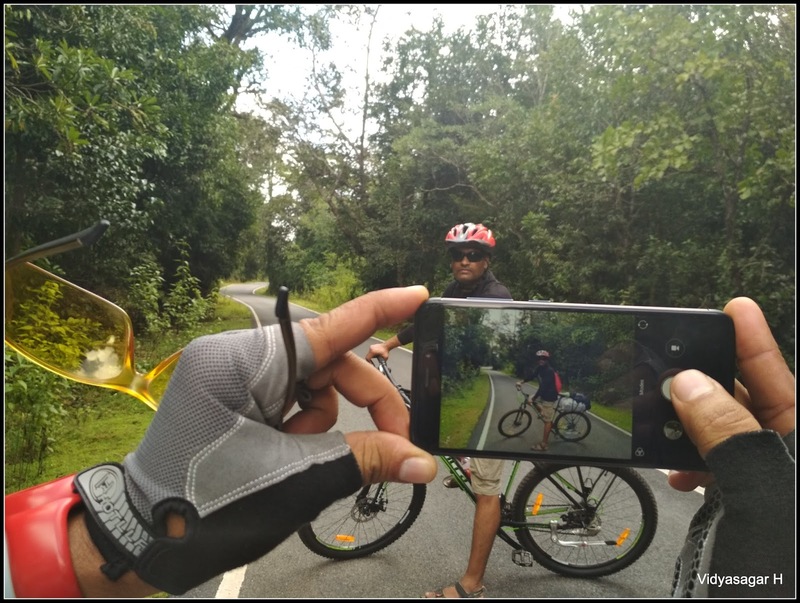 After 2 KMs distance, it was complete downhill ride. It was reminding me the Bisle Ghat ride, the trail was similar. We found many streams, small waterfalls. Explored beautiful unknown waterfalls in mid of the trail. Reached the Vibhooti falls deviation village Achave. We have to make entry in the Police check-post with all our details. The falls is around 2.5KMs up ride from this place. Continued our journey towards Vibhooti Falls. Here we found few tourist vehicles in the parking lot. We need to walk another a KMs to reach the beautiful waterfall. 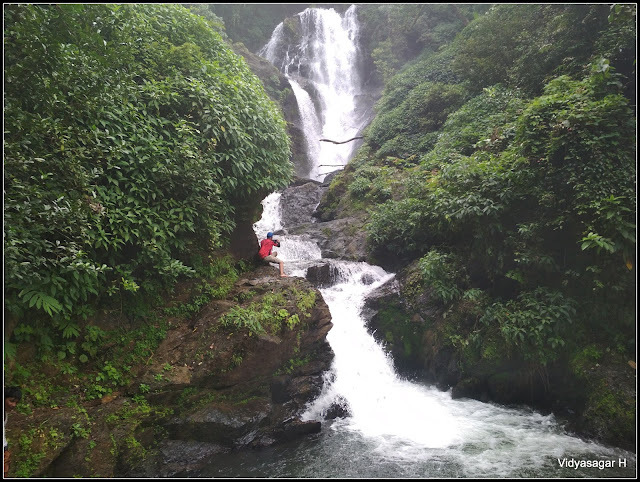 Chitchatting, taking photographs reached the Vibhooti falls. The crowd was not much, many local boys swimming in the falls. The falls is similar to Vibhooti which is white, it is almost like Irpu falls. After spending some good time, back to Achave village. The stomach is hungry, badly wanted the lunch. The hotel provides the lunch with Chapati descent food. 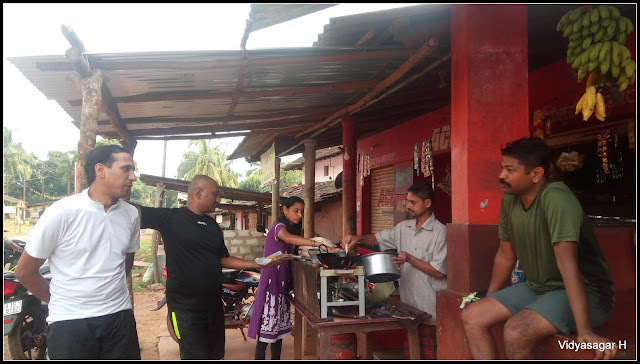 Finished the lunch and continued our journey towards Gokarna. Time was around 2.30 pm, bus to Bengaluru is around 7 pm. We set a target to reach Gokarna by 5 pm, distance was 40+ KMs. Decided not to take more breaks continued our journey. There is no any place to visit except the beautiful trail. We hit the highway road, now the vehicle movement little more. Stopped a while to have the tender coconut which cost us Rs.110/-. We should appreciate the village people for their honesty. 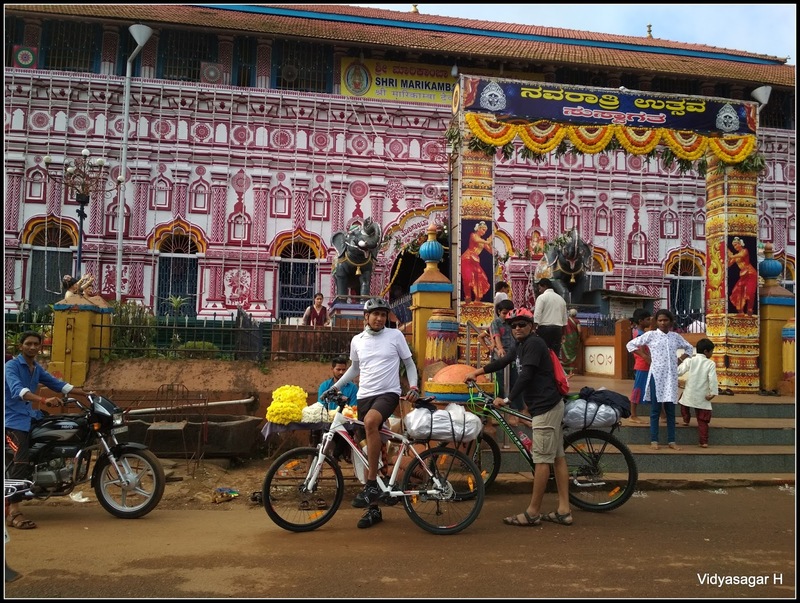 Continued our journey towards Gokarna, suddenly heard some voice on bike. Tender coconut guy came on bike to handover the bag which we left in his shop. Hope we almost raided around 5 KMS. Sudhakar vallet and Santosh Apple phone were in the bag. 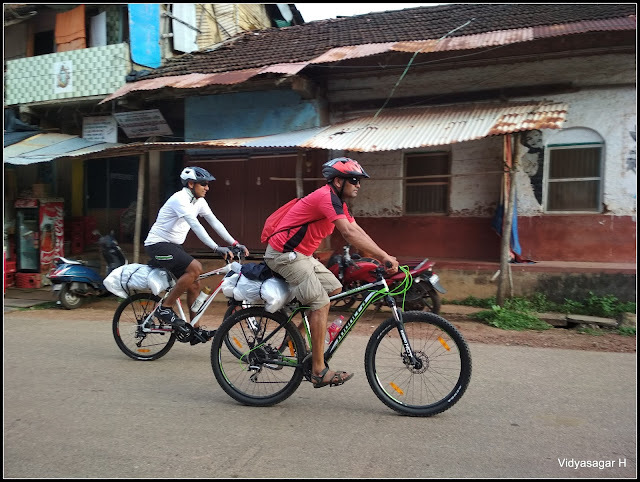 Rolling terrain finally reached the Gokarna around 5.20pm. 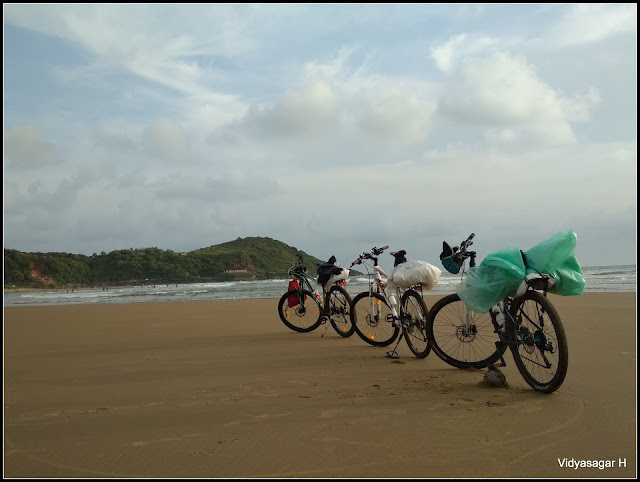 Finished our ride at Gokarna beach with Facebook live, spent good time photography. No one wanted to dip in the Sea, got refreshed nearby centre. Beautiful and most memorable ride come to an end. It’s loaded lot of golden memories to my journey. 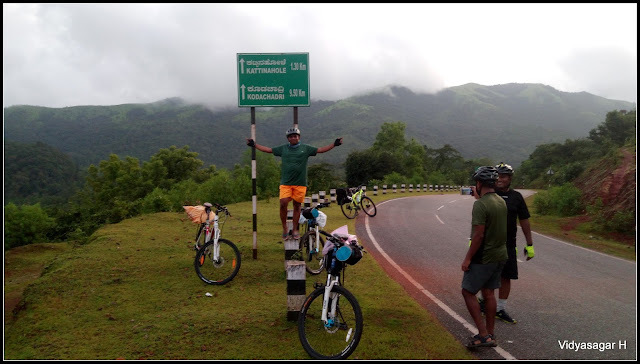 The overall ride was around 156 KMs. Thank you so much to my beloved friends Sudhakar & Santosh Gupta joining with me. Sometimes plain trail also makes tired, rolling terrain make you to exhaust your stamina, lonely interior roads make you happier to ride. 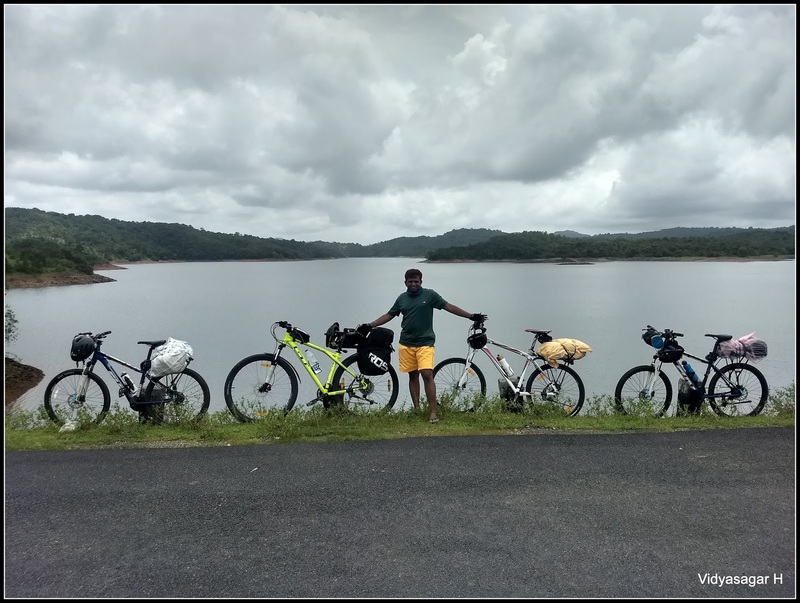 Visiting two water reservoirs Chakra and Savehaklu, camping at Kodachadri base point, crossing the Sharavathi river backwater in ferry, taking a longer route to reach Jog falls, having homemade yummy food & snacks, all these golden moments are around Sharavathi valley cycling on 2 – 3rd September 2017. 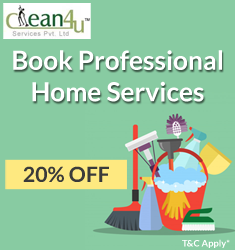 This time team is with four members Shanthi Prasad, Manjunath, Santosh & myself. 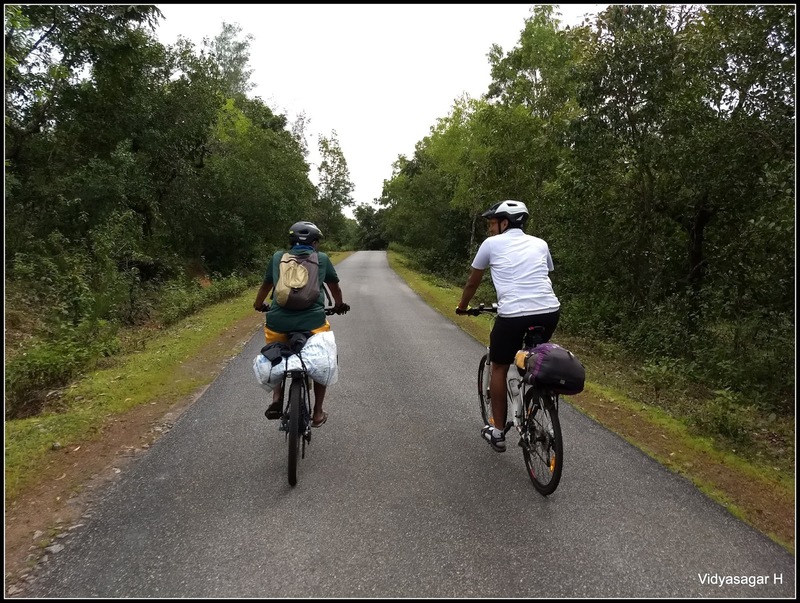 The trail and stay is finalized by my beloved friend Shanthi Prasad. 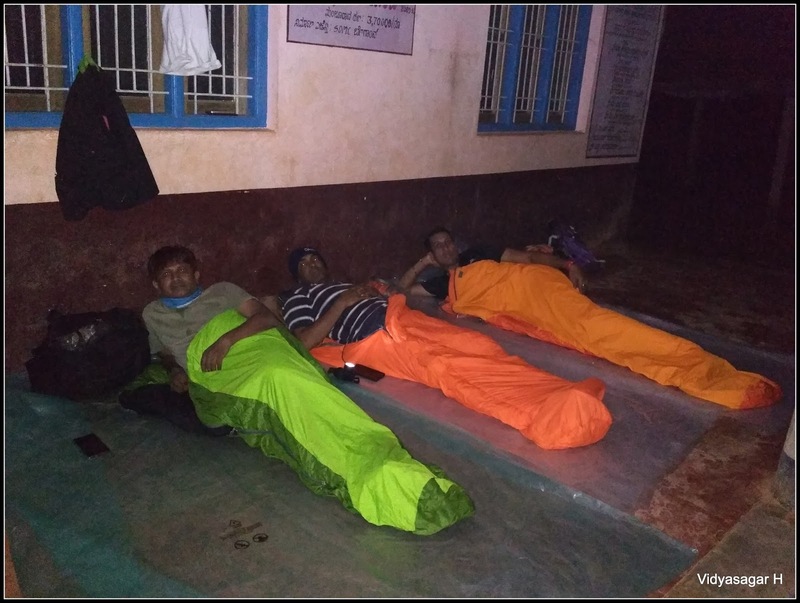 We decided to first day camp at base point of Kodachadri. We reached the Majestic bus stand on time, bus scheduled at 9.15 pm. The bus was not turned up till 10.00 pm, it was coming from Mysuru depot. The conductor & driver were very co-operative, boarded our bikes and settled in the seat. Somewhere in the midnight bus stopped, there was some issue in the battery panel. Driver did some mechanism, luckily bus started and continued our journey. The morning was chill, the bus was delayed almost an hour. We unloaded our bikes around 6.30 am at Hosanagara bus stand. Decided to get refresh at bus stand rest room. Manjunath was left his mobile in the bus, called the conductor, mobile was at his seat. We told him to collect it on Tuesday. Quickly finished the refreshment, decided to have breakfast at bus stand Udupi hotel. Filled our stomach with yummy breakfast and started the journey. 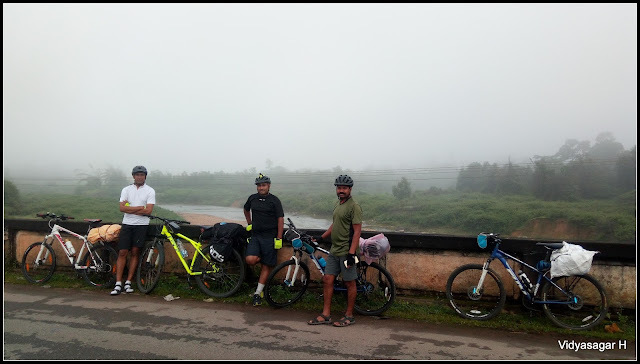 Foggy morning it was, initial trail was down one, enjoying the nature continued the journey towards Nagara. Everywhere the streams were flowing in swing, the nature was completely green carpet. Reached the Nagara Fort. Ruined fort was looking so beautiful with wearing the green carpet. 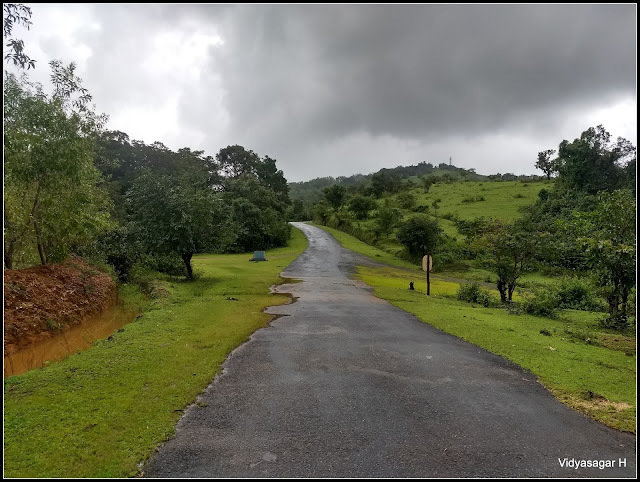 Of course, nothing is there except ruined boundaries, however still it looks so beautiful in the monsoon. We had good time photography and spent more time. 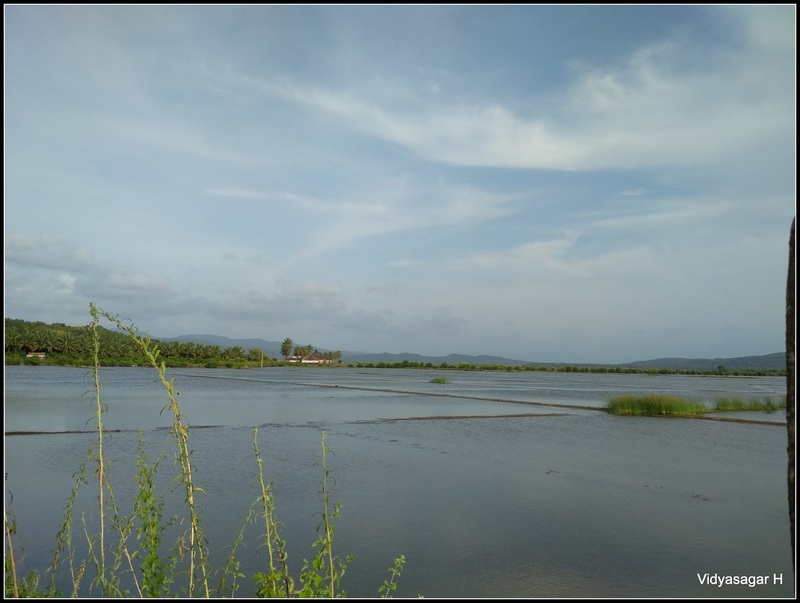 Journey is continued towards Saavehaklu Dam. 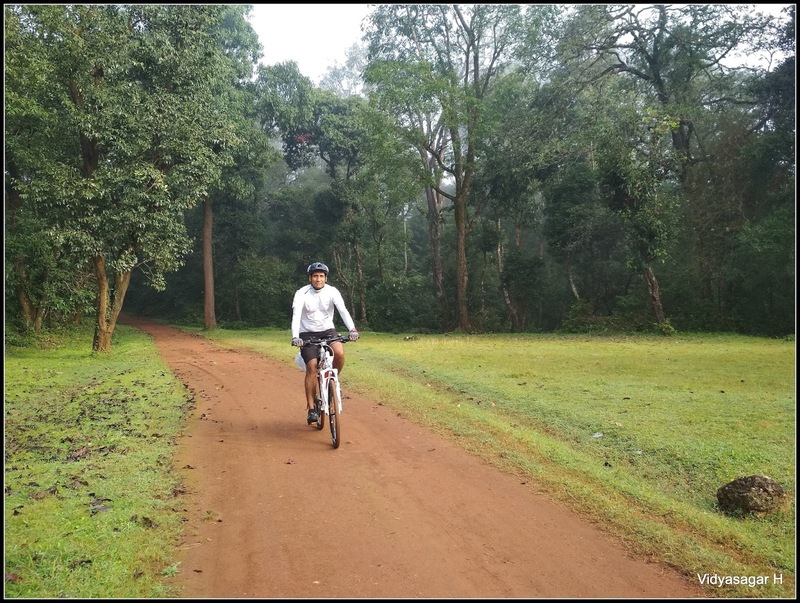 Lonely forest trail will make you more happy to ride on it. Taking small break reached the Dam. Security is deployed to monitor the dam, took the permission and headed towards the Dam. Spent good time, had some snacks. We all thankful to Manjunath for bringing yummy snacks. 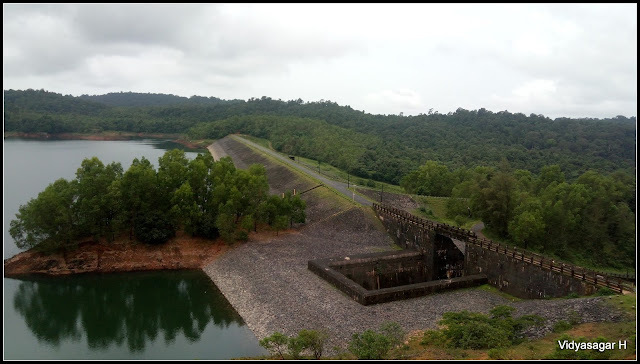 After good time spend, decided to move towards to Chakra Dam. It is almost 12 KMs from this place. The upward journey will make you more tiered, reached Chakranagara and continued towards Dam. People are not much aware this place, lonely roads welcomed us. Reached the Chakradam, security restricted us to enter into the premises. We decided to have the lunch, thanks to Santosh & Manju for bringing homemade food. About to start the lunch, rain started. Thanks to security personnel, sparing his room for lunch. Rain was on its job, though not to spend more time to leave in the rain. It was light drizzling, continued our journey towards Sampekatte. 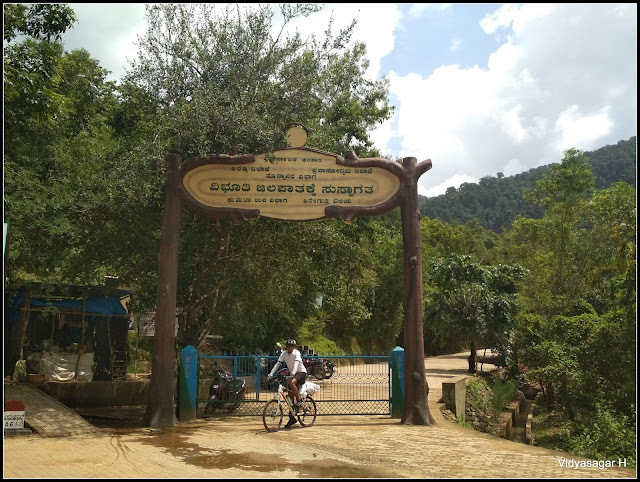 From Chakram Dam to Chakranagar, 4 KMs trail is tough. Crossing many small villages again we rejoined to Shivamogga – Kollur highway. 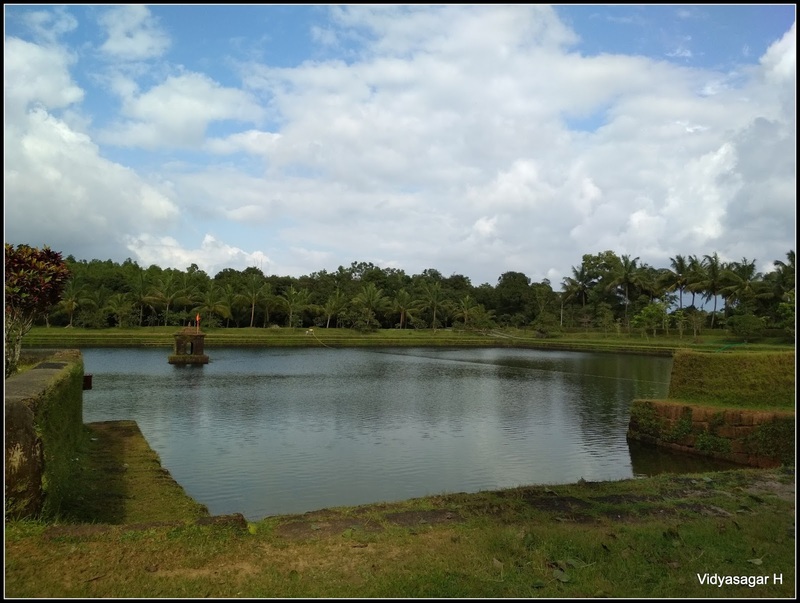 Soon we reached Sampekatte. Team wanted evening snacks with coffee, found descent hotel. Hot delicious Bajji – Bonda with coffee filled our stomach. We met an interesting young personality Srinath Puranik. He is pursuing his final year engineering in Bengaluru. He is in preparation of documentary about Rivers in Karnataka. The interesting part is, he was solo, doing the entire documentary alone. Just we wished him for good luck and continued our journey. Our day one ride left just 11 KMs, we had enough of time to retire the day. 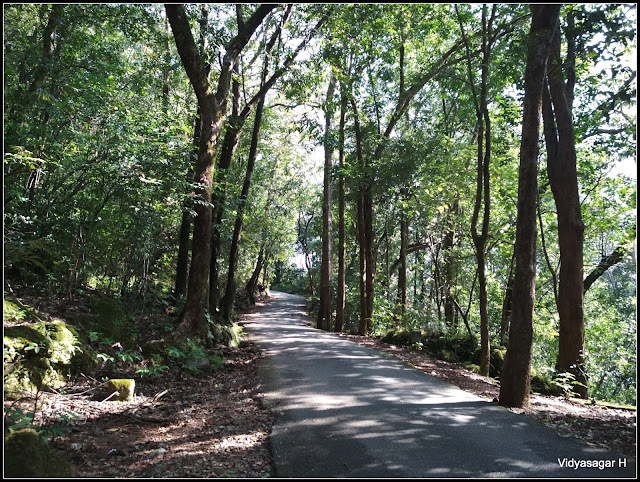 Spent some good time viewing Kodachadri range and photography. Reached the Kattinahole village home for day one camp. Dumped our luggage in the room, got refreshed by hot water bath. It gave more relax to our mind and body. Hot delicious dinner is served, and relaxed for the day. The day one is went well, we covered around 71 KMs. 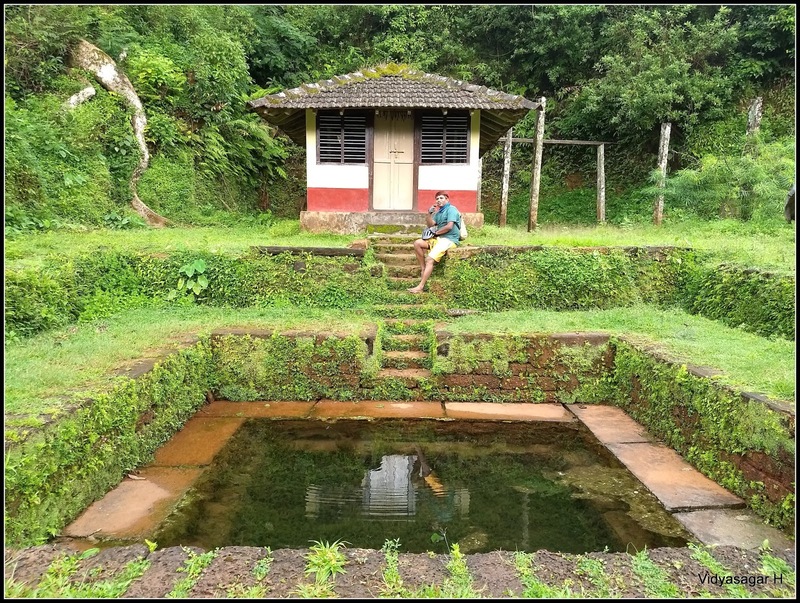 The day is started so early, we finished our morning core job at village home and adieu to Kodachadri range. On the way, had tea & biscuits near by hotel. 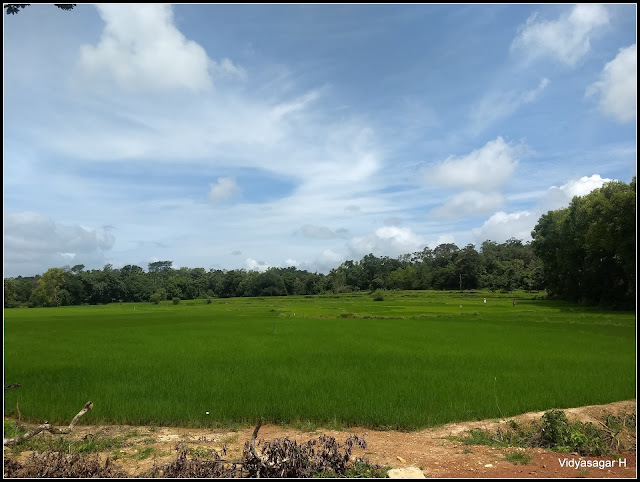 The journey is continued towards Hasirumakki – Sagara. 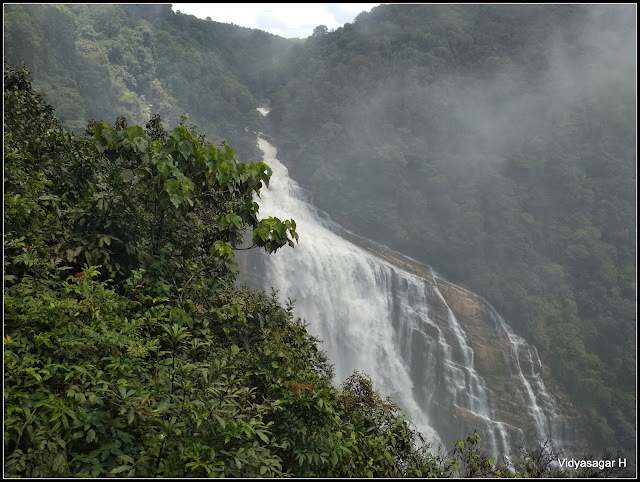 We changed our route, after internal discussion decided to cover Jog falls, which was not in our initial plan. 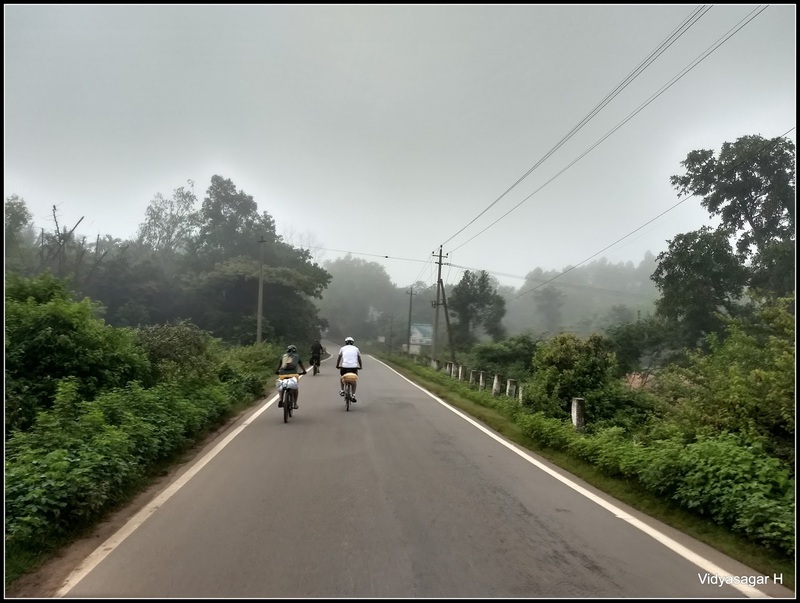 Morning ride was thrilling, continued our journey towards Hasirumakki. 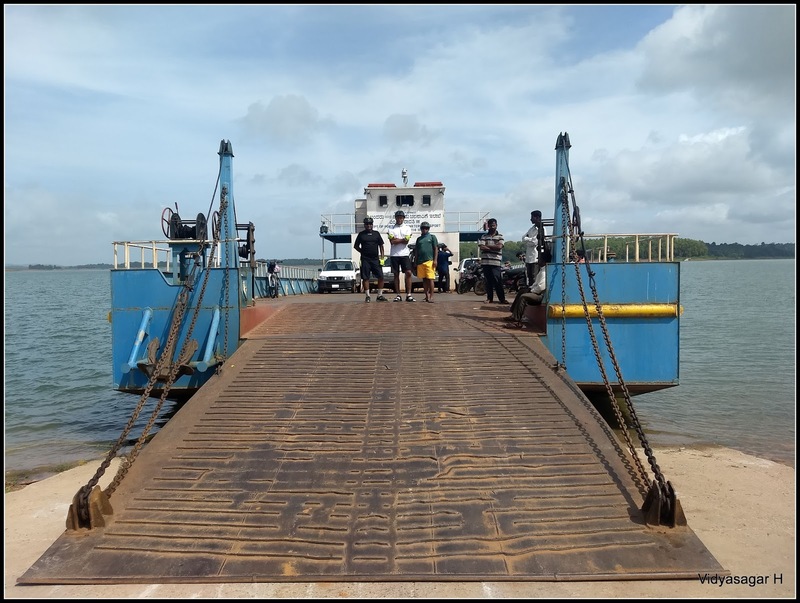 We have to cross the Sharavathi backwater in Ferry at Hasirumakki. On the way decided to give a break for breakfast. Santosh brought self- prepared Parotha for breakfast. Found some descent place and finished the yummy food. We reached Ferry point of Sharavathi backwater. Couple of vehicles and people were waiting to cross the river. It was quite less traffic compare to Sigandoor Ferry point. We spent some good time in photography. Boarded the Ferry, enjoyed the ride. The ferry ride was short, soon we alighted other end. Journey was continued towards Sagara. The heat was more compare to yesterday. 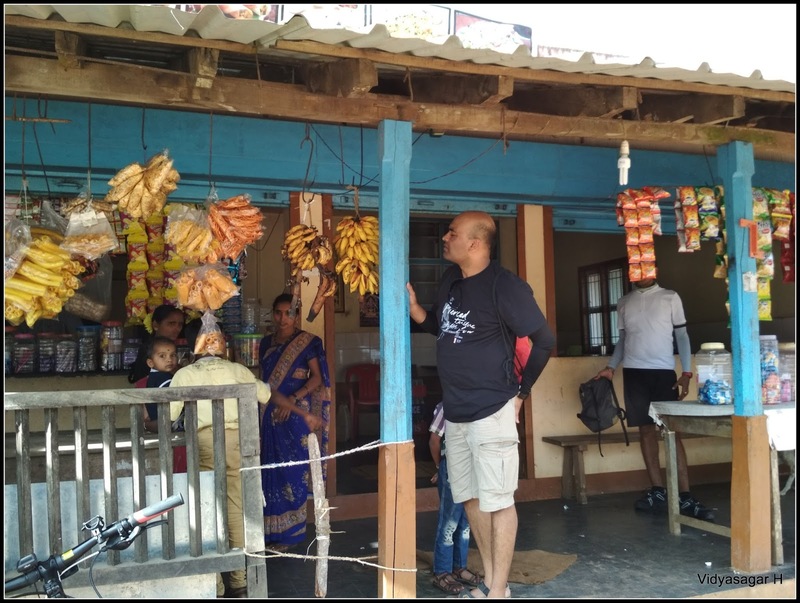 Enjoying the curving trail reached the Ikkeri junction. Again we discussed about the trail. 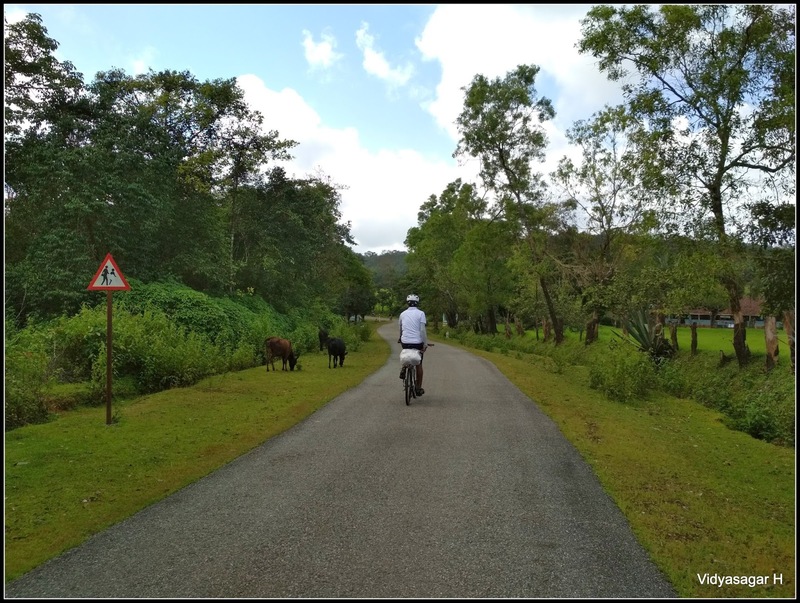 Taking the Sagara route, riding on highway, Jog falls distance is very less. Keeping the calm ride, decided to take longer route of Ikkeri, Sridhara Ashrama, Talaguppa and Jog falls. Ikkeri ancient temple is really beautiful, spent some good time and continued towards Sridhara Ashrama. 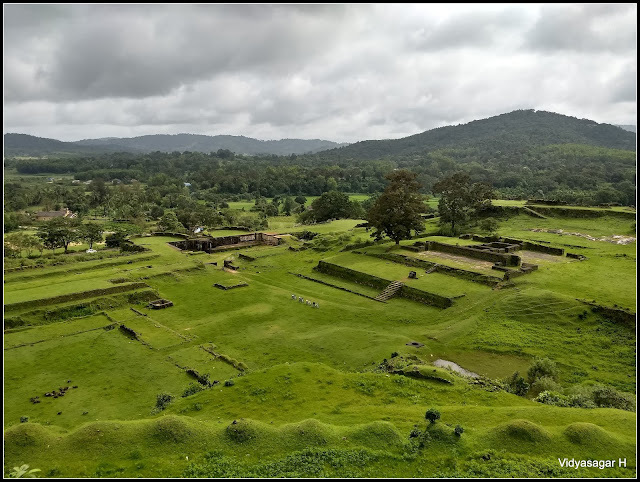 The Ashrama is around 6 KMs away from Ikkeri temple. 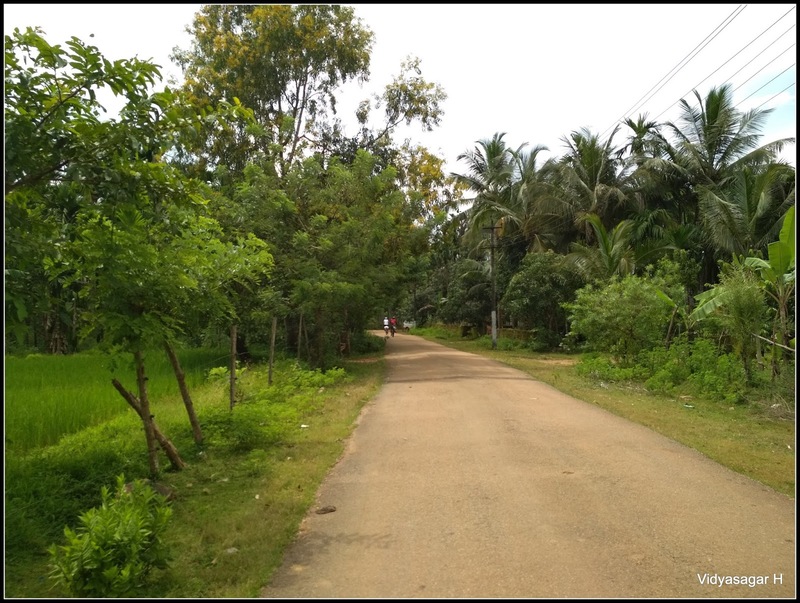 Now the roads were lonely, village interior roads gave lot of beautiful landscape. Now the lunch time, we reached the Ashram around 1.15pm. We took the prasada in Dasoha, devotees were more. After spending little time continued our journey towards Talaguppe. 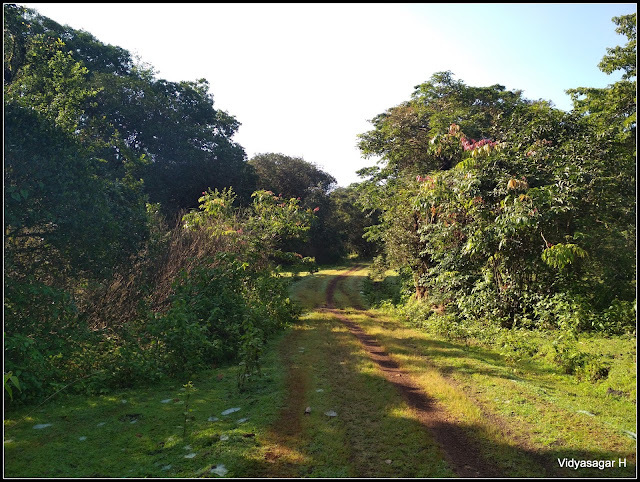 The trail is rolling but challenging one, heat was itching and making more tiered to us. Lonely trail makes you to forget the tiredness. Reached the Talaguppe at 4 pm. Now the Jog falls is just 15 KMs away. Highway traffic was more, the road was worst where water flow during monsoon. The team spirit was high, continued our journey and reached the Jog Falls at 5.15 pm. Water was not much, however falls has not disappointed us. I think this is 6th visit to this beautiful place, however this is the first time where I have seen more water. We had long discussion about next ride towards Sagara. The time was less, the initial 4KMs trail is tough. Keeping the time constrain, decided to hire vehicle to Sagara. Before that team wanted to have the evening snacks, filled our stomach with Bhelpuri + coffee. Reference with local person, we got a Diesel Goods Auto on hire. 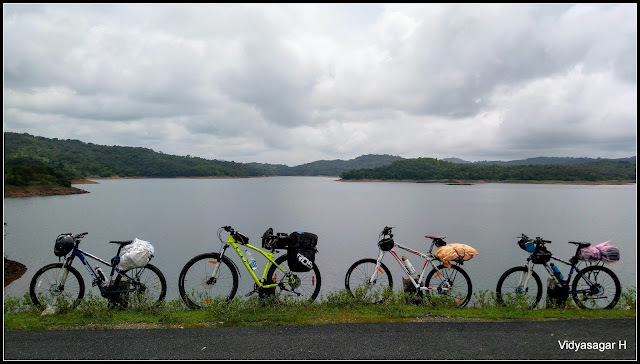 Loaded our bikes and headed towards the Sagara. We reached the Sagara at 8.30 pm and our bus scheduled at 10 pm. Got refreshed at Bus stand, finished the dinner nearby hotel, boarded the bus towards Bengaluru. Second journey was quite tough. We peddled around 90+ KMs difficult trail. 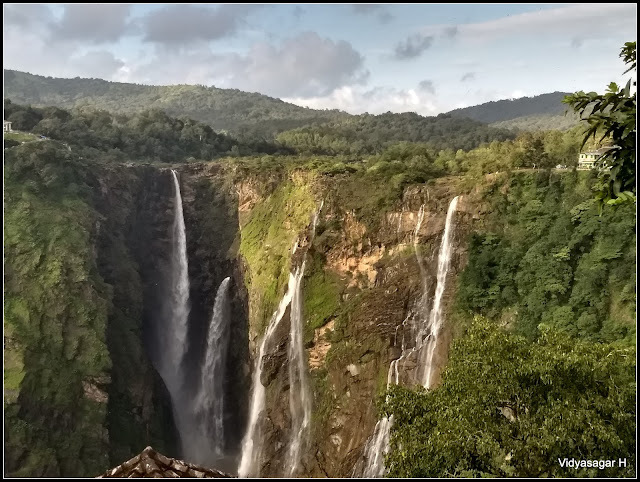 The good part is, we took a call to board on Auto at Jog falls, else it was really tough one to cover Sagara. 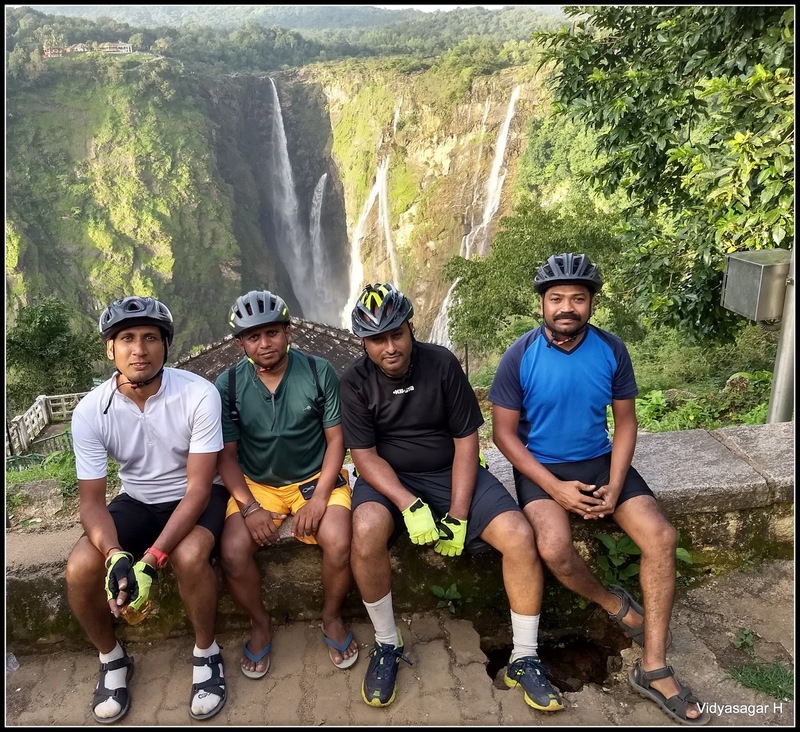 The memorable Sharavathy valley ride ended at Jog falls with excellent friends.